Retired Boston Celtics forward Cedric Maxwell, left, and former MLB pitcher Al Leiter speak Tuesday with Capitol reporters. 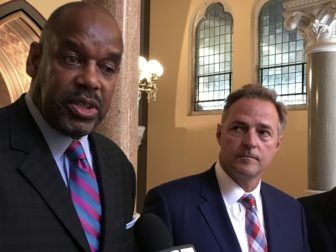 Two major sports leagues sent retired stars to the Capitol on Tuesday to urge Connecticut to regulate sports gambling in a way that best preserves the integrity of professional athletics. Former Boston Celtics forward Cedric Maxwell and Al Leiter, a starting pitcher for two decades from the late 1980s through early 2000s, also advocated for what some term the “integrity fee,” giving professional leagues a share of state betting revenues. These would be needed, the sports representatives said, to provide the technology and security enhancements that would be absolutely essential if the U.S. Supreme Court gives the green light to legalized sports betting later this spring. “I think the biggest thing Al and I are thinking about is the integrity of the game,” said Maxwell, a key player on Boston Celtics championship teams in 1981 and 1984, and now a Celtics commentator with WBZ-TV in Boston. Maxwell, 62, who came to the Capitol on behalf of the National Basketball Association, said no one in professional sports wants a “black eye” from a gambling scandal. Leiter, 52, who now serves as a studio analyst for the MLB Network and a color commentator for the YES Network, asked reporters to imagine the role Major League Baseball and other major sports franchises might play in a legalized sports betting industry — potentially subject to various regulatory systems in 50 different states. Baseball and basketball games, not to mention other sports contests, are dominated by key statistics that official scorers manage — and that league websites attempt to update within minutes of decisions being made and actions taking place on the field or the court. What happens, Leiter asked, when huge dollars are at stake and people are placing bets — in some cases minute-to-minute — responding to one play or another? League representatives did not say how much of a fee leagues should receive. West Virginia’s legislature considered an “integrity fee” equal to 1 percent of all sports wagers from state residents, but did not include the fee in the regulatory bill it passed earlier this spring. Maxwell, whose pro career stretched from 1977 through 1988, recalled how FBI officials briefed NBA players each year on the types of issues they should not discuss before a game to avoid becoming entangled in any illegal gambling scandal. Close collaboration between professional leagues and government entities not only protects the finances of gamblers. “Some of the rules they’ve talked about, we’ve heard about, are for the protection of the players, the protection of the game, and that’s huge,” Maxwell said. A case that could legalize sports betting in all 50 states is currently before the court and a decision is expected by early June. In the case of Christie v. the National Collegiate Athletic Association, the state of New Jersey is contesting a national law restricting sports betting. At issue is the federal government’s authority to regulate commerce among the states set against rights reserved for states by the 10th Amendment to the U.S. Constitution. As part of the regulatory framework set forth in Connecticut’s bill, the state’s casinos, licensed off-track betting facilities and the Connecticut Lottery Corporation all would be authorized to offer sports betting. The Department of Consumer Protection also would have the authority to license new providers. Very preliminary fiscal estimates are that the state could gain $40 million to $80 million annually by imposing fees on sports betting, Aresimowicz said back in February.